27 INCREDIBLE FEATURES IN ONE HOODIE! The Blue Crane Hoodie ELITE is both a BACKPACK and a HOODIE that carries all your essentials, but also wows and marvels with exciting features such as: a bottle opener zipper, over 10 pockets, pillow conversion, a facemask, a sleepmask and many more . It's the ultimate piece of apparel for life's thrill seekers. The Blue Crane Hoodie ELITE qualifies for FREE DELIVERY. Due to a high demand, please allow up to 7 WORK DAYS (not 3-5 work days) for the delivery of your BC Elite hoodie. Please make sure you triple check our size chart at the bottom before ordering your size. Not just a backpack. Not just a hoodie. It’s both! Whatever the journey, The BC Elite Hoodie is guaranteed to keep you up to the task. We’ve made it our goal to create an all-in-one hoodie-and-backpack that is packed with creativity and innovation, but that is above all an everyday hoodie that you’ll want to wear day in and day out. From backpack-to-hoodie or hoodie-to-bacpack in a matter of seconds! The BC hoodie transforms from backpack-to-hoodie or from hoodie-to-backpack seamlessly in just a matter of seconds. You no longer have to carry around a bacpack and jacket separately. You no longer have to try and squish everything into your travel-sized bag. You no longer have to worry about being unprepared for a sudden change of weather. You no longer have to worry. Your day becomes just that little bit easier and less frustrating with the magic provided by the Blue Crane Hoodie ELITE. As a hoodie, the Blue Crane hoodie is, in its most natural form, a stylish and modern everyday hoodie that has been crafted with intense care and an extreme attention to detail. We’ve focused on creating a hoodie that is luxurious in its feel and trendy in its look that is perfect for any occasion. Only after focusing on an alluring appearance does the focus shift to the features of the hoodie. And boy are the features a sight to behold as well. The BC Elite hoodie is integrated with 27 remarkable features that will make sure you’re ready for whatever the journey of life will throw at you. 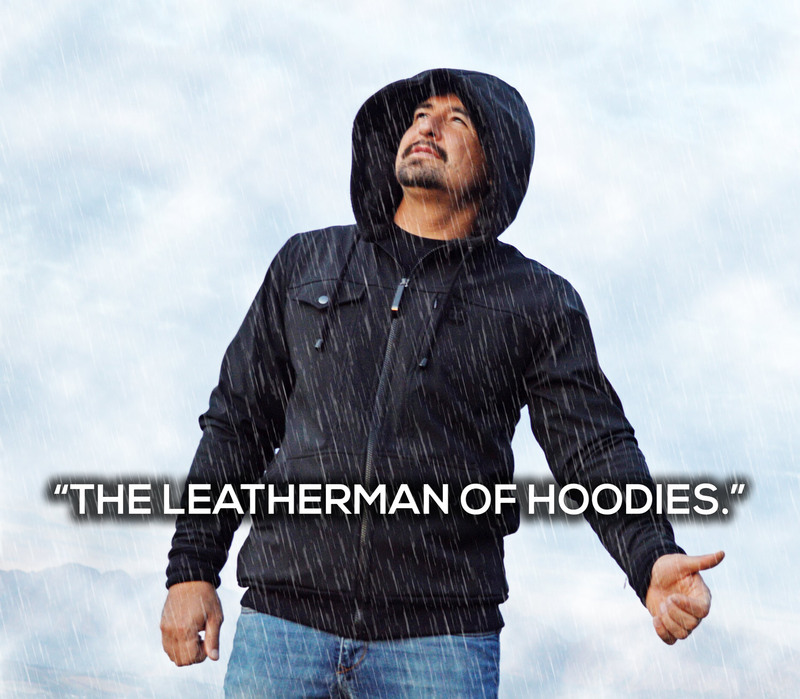 The hoodie is made from premium quality Softshell Waterproof Microfleece. The inside lining on the body is lined with 160gram cotton, giving it an instant quality feel and look. The inside of the hood is lined with Mongolian fleece, one of the softest and most luxurious pieces of fabric available. As a backpack the BC hoodie is perfectly compact in size even though there’s a barely noticeable full size hoodie zipped up and hiding on the inside. In backpack form there’s a middle slot that can be clipped open or closed with more than enough space to hold even more of your essentials. The great thing is that once you’ve folded your hoodie up and transformed it into a backpack, everything you’ve stored inside the hoodie’s pockets will all still be on the inside of the bag, safely and securely. The bacpack is made from 110gram high quality and lightweight Waterproof fabric so that it doesn’t weigh things down. The Blue Crane Hoodie logo is printed with a glow in the dark print to help you find your hoodie/backpack easily in the dark.